The Miami Orange Bowl was an outdoor athletic stadium in the southeastern United States, located in Miami, Florida, west of downtown in Little Havana. Considered a landmark, it was the home stadium for the Miami Hurricanes college football team, and the professional Miami Dolphins for their first 21 seasons, until the opening of Joe Robbie Stadium in nearby Miami Gardens in 1987. The stadium was the temporary home of the FIU Golden Panthers while its FIU Stadium underwent expansion during the 2007 season. In its early years, the Orange Bowl had no defined conference tie-ins; it often pitted a team from the southeastern part of the country against a team from the central or northeastern states. From the 1950s until the mid-1990s, the Orange Bowl had a strong relationship with the Big Eight Conference. The champion (or runner-up in years in which the “no-repeat” rule was invoked) was invited to the bowl game in most years during this time; the 1979 Orange Bowl even had two representatives from the Big Eight. Opponents of the Big Eight varied; but were often major independents, runners-up in the Southeastern Conference (SEC), or champions of the Atlantic Coast Conference (ACC). Since 2007, the Orange Bowl has hosted the ACC champion—unless they are involved in the national championship playoff, in which case another high-ranking ACC team team takes their place)  —and has used the brand Home of the ACC Champion. The Big Eight Conference was a National Collegiate Athletic Association (NCAA)-affiliated Division I-A college athletic association that sponsored football. It was formed in January 1907 as the Missouri Valley Intercollegiate Athletic Association (MVIAA) by its charter member schools: the University of Kansas, University of Missouri, University of Nebraska, and Washington University in St. Louis. Additionally, the University of Iowa was an original member of the MVIAA, while maintaining joint membership in the Western Conference. The 1979 edition of the Orange Bowl was played on Monday, January 1 in Miami, Florida, and featured the #6 Nebraska Cornhuskers and the #4 Oklahoma Sooners, both of the Big Eight Conference. The Bowl Alliance was an agreement among college football bowl games for the purpose of trying to match the top two teams in a national championship bowl game and to provide quality bowl game matchups for the champions of its member conferences. The agreement was in place for the 1995, 1996, and 1997 seasons and had replaced the Bowl Coalition. Each participating team in the Bowl Alliance Championship received $8.5 million from the television sponsors. Pasadena is a city in Los Angeles County, California, United States, located 10 miles northeast of Downtown Los Angeles. The Orange Bowl was played at Miami Field  (located where Miami Orange Bowl was later built) from 1935 to 1937, the Miami Orange Bowl from 1938 to 1996 and 1999, and was moved to its current site, Hard Rock Stadium in Miami Gardens, Florida, in December 1996. The game was moved back to the namesake stadium in 1999 (which would be the final bowl game ever in the Miami Orange Bowl) because the game was played on the same day the Miami Dolphins hosted an NFL Wild Card Playoff game. Coincidentally, both of those games were aired on ABC. 1 2 3 Miami was a member of the SIAA during the 1935 Orange Bowl. It was an independent team during the 1946, 1951, 1984, 1988, and 1989 Orange Bowls. It was a member of the Big East during the 1992, 1995, and 2004 Orange Bowls. It was a member of the ACC during the 2017 Orange Bowl. 1 2 Florida State was an independent team during the 1980 and 1981 Orange Bowls and was a member of the ACC during the 1993, 1994, 1996, 2001, 2004, 2006, 2013 and 2016 Orange Bowls. The game was previously officially known as the Discover Orange Bowl, since Discover Financial was announced as title sponsor on August 26, 2010 as part of a new four-year agreement. The game had been called the FedEx Orange Bowl from 1989 to 2010, as FedEx sponsored the event during that period. Starting with the 2010–11 season, ESPN carried the Orange Bowl, replacing Fox after four seasons. ABC aired the game from 1999 to 2006, with CBS (1995–1998) and NBC (1964–1994) previously carrying the game. Discover stated that they would not renew their sponsorship of the game further on June 9, 2014; the game will be a part of the College Football Playoff in the future, and CFP rightsholder ESPN has asked for higher sponsorship fees, in return. On September 22, 2014, Capital One was announced as the new title sponsor of the Orange Bowl, transferring their bowl game sponsorship from the Citrus Bowl. Subsequently, the company's "Capital One Mascot Challenge" winner naming ceremony also moved to the Orange Bowl. ESPN is the current rightsholder of the Orange Bowl, a relationship that began in 2011 as part of the contract to broadcast the Bowl Championship Series games. In anticipation of the transition to the College Football Playoff in the 2014–15 season, ESPN reached a new deal with the game's organizers in November 2012 to extend its rights through 2026, paying $55 million yearly. The game is also broadcast nationally by ESPN Radio. The Peach Bowl is an annual college football bowl game played in Atlanta since December 1968. Since 1997, it has been sponsored by Chick-fil-A and officially known as the Chick-fil-A Peach Bowl. From 2006 to 2013, it was officially referred to as simply the Chick-fil-A Bowl. In college football, the term Power Five conferences refers to five athletic conferences whose members are part of the Football Bowl Subdivision (FBS) of NCAA Division I, the highest level of collegiate football in the United States. The conferences are the Atlantic Coast Conference (ACC), Big Ten Conference (B1G), Big 12 Conference, Pac-12 Conference, and Southeastern Conference (SEC). The term "Power Five" is not defined by the National Collegiate Athletic Association (NCAA), and the origin of the term is unknown. It has been used in its current meaning since at least 2006. The term is also used in other college sports. The teams that participate in the National Collegiate Athletic Association's Division I Football Bowl Subdivision earn the right to compete in a series of post-season games called bowl games. As of 2017, there are 40 bowl games, and all are contractually obligated to offer bids to specific conferences, a situation known as a "tie-in". The "top" six bowl games in the nation select their teams as part of the College Football Playoff (CFP), which was put into place for a minimum of 12 years, beginning with the 2014 season. Prior to 2014, the top five games in the country were chosen under the system known as the Bowl Championship Series. The bowls outside of the CFP, have individual contracts with the conferences to offer preferential bids to teams from those conferences. As long as teams are bowl eligible, they may be selected by these bowls to meet these contracts. 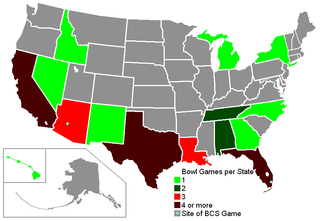 The Bowl Championship Series (BCS) was a selection system designed, through polls and computer statistics, to determine a No. 1 and No. 2 ranked team in the NCAA Division I Football Bowl Subdivision (FBS). After the final polls, the two top teams were chosen to play in the BCS National Championship Game which determined the BCS national champion team, but not the champion team for independent voting systems. This format was intended to be "bowl-centered" rather than a traditional playoff system, since numerous FBS Conferences have expressed their unwillingness to participate in a play-off system. However, due to the unique and often esoteric nature of the BCS format, there had been controversy as to which two teams should play for the national championship and which teams should play in the four other BCS bowl games. In this selection process, the BCS was often criticized for conference favoritism, its inequality of access for teams in non-Automatic Qualifying (non-AQ) Conferences, and perceived monopolistic, "profit-centered" motives. In terms of this last concern, Congress has explored the possibility on more than one occasion of holding hearings to determine the legality of the BCS under the terms of the Sherman Anti-Trust Act, and the United States Justice Department has also periodically announced interest in investigating the BCS for similar reasons. The 2010–11 NCAA football bowl games concluded the 2010 NCAA Division I FBS football season and included 35 team-competitive bowl games and four all-star games. The games began play with three bowls on December 18, 2010 and included the 2011 BCS National Championship Game in Glendale, Arizona played on January 10 at the University of Phoenix Stadium. The bowl season concluded with the East–West Shrine Game, the Eastham Energy All-Star Game, the Senior Bowl, the Dixie Gridiron Classic, and the NFLPA Game. One bowl, the Toronto-based International Bowl, has ceased operations. The 2012–13 NCAA football bowl games were a series of college football bowl games. They concluded the 2012 NCAA Division I FBS football season, and included 35 team-competitive games and four all-star games. The games began on Saturday December 15, 2012 and, aside from the all-star games, concluded with the 2013 BCS National Championship Game in Miami Gardens, Florida that was played on January 7, 2013. The 2013–14 NCAA football bowl games were a series of college football bowl games. They concluded the 2013 NCAA Division I FBS football season, and included 35 team-competitive games and three all-star games. The games began on Saturday December 21, 2013 and, aside from the all-star games, ended with the 2014 BCS National Championship at the Rose Bowl in Pasadena that was played on January 6, 2014. The 2014–15 NCAA football bowl games were a series of college football bowl games. They completed the 2014 NCAA Division I FBS football season, and included 39 team-competitive games and four all-star games. The games began on December 20, 2014 and, aside from the all-star games, ended with the 2015 College Football Playoff National Championship which was played on January 12, 2015. The 2015–16 NCAA football bowl games were a series of college football bowl games. They completed the 2015 NCAA Division I FBS football season. The games began on December 19, 2015 and, aside from the all-star games, ended with the 2016 College Football Playoff National Championship which was played on January 11, 2016. The New Year's Six (NY6) bowls are the top six major NCAA Division I Football Bowl Subdivision bowl games: the Rose Bowl, Sugar Bowl, Orange Bowl, Cotton Bowl, Peach Bowl, and Fiesta Bowl. The New Year's Six represent six of the ten oldest bowl games currently played at the FBS level. These six top-tier bowl games rotate the hosting of the two College Football Playoff (CFP) semifinal games, which determine the teams that play in the final College Football Playoff National Championship game. The rotation is set on a three-year cycle with the following pairings: Rose/Sugar, Orange/Cotton, and Fiesta/Peach. ↑ "Bowl projections, predictions: Playoff set, Michigan vs. Florida State a big-time game" . Retrieved 31 December 2017. 1 2 "1936 Orange Bowl". The Catholic University of America . Retrieved 2013-10-10. ↑ "2019-2020 College Football Playoff, New Year's Six, Bowl Schedule, Conference Matchups". CollegeFootballNews.com. January 14, 2019. Retrieved April 13, 2019. ↑ "Dates Announced for College Football Playoff Games Through 2026". collegefootballplayoff.com (Press release). August 30, 2018. Retrieved April 13, 2019. ↑ "Capital One Becomes Title Sponsor of the Orange Bowl". Atlantic Coast Conference . 22 September 2014. Retrieved 22 September 2014. 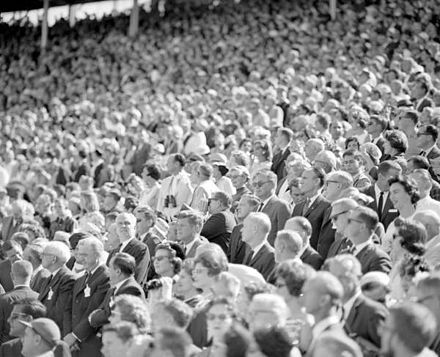 Wikimedia Commons has media related to Orange Bowl .